With the rise in global economic instability, the looming threat of catastrophic climate change, and capitalism close to breaking point, the time has never been more ripe to arm yourself with the Theory you need on your book-shelves! Until April 16 (23.59 EST) all the books on this list are 50% off! Includes free bundled ebooks (where available). Historian and political thinker Ellen Meiksins Wood argues that theories of “postmodern” fragmentation, “difference,” and con-tingency can barely accommodate the idea of capitalism, let alone subject it to critique. In this book she sets out to renew the critical program of historical materialism by redefining its basic concepts and its theory of history in original and imaginative ways, using them to identify the specificity of capitalism as a system of social relations and political power. A key text in Lefebvre’s oeuvre, Metaphilosophy is also a milestone in contemporary thinking about philosophy’s relation to the world. The more we know about the catastrophic implications of climate change, the more fossil fuels we burn. How did we end up in this mess? A guide to the thinkers and ideas that will shape the future. 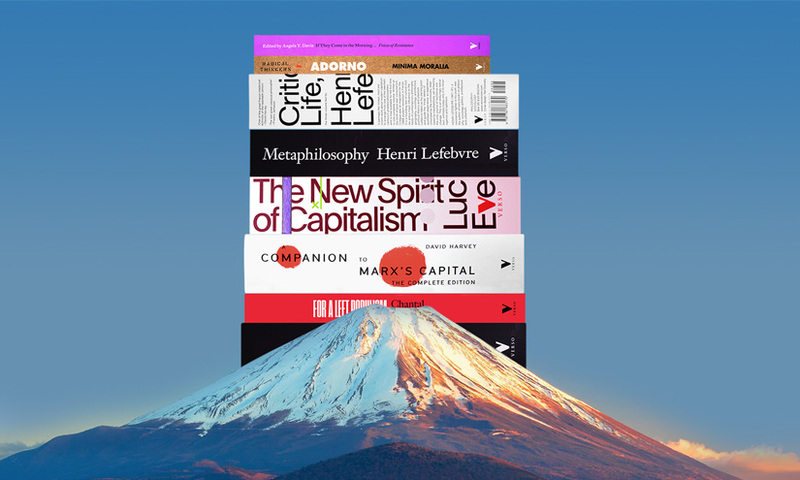 Now a classic of Marxian economics, The Limits to Capital provides one of the best theoretical guides to the history and geography of capitalist development. In this edition, Harvey updates his seminal text with a substantial discussion of the turmoil in world markets today. A fascinating dialogue on a new Communist Manifesto from two giants of twentieth century philosophy. Adorno, Foucault, and the Critique of the West argues that critical theory continues to offer valuable resources for critique and contestation during this turbulent period in our history. To assess these resources, it examines the work of two of the twentieth century’s more prominent social theorists: Theodor W. Adorno and Michel Foucault.. Representing Capital, Fredric Jameson's first book-length engagement with Marx's magnum opus, is a unique work of scholarship that records the progression of Marx's thought as if it were a musical score. Fredric Jameson’s pathbreaking essay “An American Utopia” radically questions standard leftist notions of what constitutes an emancipated society. Imagined Communities remains the most influential book on the origins of nationalism, filling the vacuum that previously existed in the traditions of Western thought. Cited more often than any other single English-language work in the human sciences, it is read around the world in more than thirty translations. Tracking the development of Foucault’s key concepts. Today, as global capitalism comes apart at the seams, we are entering a new period of transition. In Less Than Nothing, the product of a career-long focus on the part of its author, Slavoj Žižek argues it is imperative we not simply return to Hegel but that we repeat and exceed his triumphs, overcoming his limitations by being even more Hegelian than the master himself. A major systematic study of the connection between Marx and Lacan’s work. A compelling analysis of fascism, replete with insights into the authoritarian movements and states of our time. How neoliberalism is causing a social crisis in Germany. A remarkable history of the formation of Marxist thought. First English-language collection of writings by the legendary nineteenth-century insurrectionist. One of the world’s leading anthropologists assesses the work of the founder of structural anthropology. A sweeping account of the way lesbian, gay, and bisexual people have challenged and changed society. Come Together tells the incredible story of the emerging radicalism of the Gay Liberation Front, providing a vivid history of the movement, as well as the new ideas and practices it gave rise to across the United Kingdom. Before marriage equality or military service, Come Togetherreminds us of paths forged but not taken by queer politics in its earliest stages. Really Existing Nationalisms challenges the conventional view that Marx and Engels lacked the theoretical resources needed to understand nationalism. It argues that the two thinkers had a sophisticated insight into the subject, and that the reasoning behind their policy towards specific national movements was often subtle and sensitive to the ethical issues at stake. A comprehensive history of the development of Marxist theory and the parameters of 21st-century politics. The first full presentation of a fundamental aspect of Marx, the concept of need.